Online research modules make the Net work. They structure student activities efficiently and effectively. They protect teachers from unreasonable demands. They deliver the goods. "It's like a huge landfill!" Flushed from hours of mining the 10,299 Web pages dredged up by consulting AltaVista or one of the other leading search engines, the Net Savvy teacher throws hands toward the sky. "I don't have time for this nonsense. I just wanted good information on acid rain." Surfing is not a practical or appealing option for those teachers who find there is already too little time to cover the curriculum while meeting the expanded testing demands of most states. Online research modules provide a path which even the most technophobic teacher can follow with a class of students. They offer clear instructions as well as daily activities which focus on higher level thinking and electronic resources which have been tested for quality. I. What are Online Research Modules? The best way to learn about online research modules is to explore some examples. The following units were developed by teams of middle school teachers in Bellingham, Washington, in June of 1997. When you visit, identify the characteristics they all hold in common. Each team of teachers began construction by spending a morning enjoying a series of online learning modules designed to show how to build unit based upon The Research Cycle. These modules clarified the structures and elements required to invent a unit which would engage students at a high level of decision-making or problem-solving in line with the AASL Information Standards. They require that students make answers instead of finding answers. Students are energized by the question and the task. They have a clear focus upon a single essential question which calls for problem solving or decision-making. They include assessment throughout the entire process, not just at the end. They explore information from pay-for-service sources such as the Electric Library as well as the "free Internet." II. How are Online Research Modules Built? The teachers in Bellingham were able to follow a carefully structured invention process which included all of the scaffolding required to produce a high quality unit. They supplied the curriculum know-how, the great questions and the activities which make each unit engaging, intriguing and worth pursuing. Make sure you have bookmarked this page before you leave here so you can easily return to finish the article. The goal is to build lesson plans for 6-8 visits to a computer lab which will take students through the entire Research Cycle. One of the most powerful tools to teach students is the "telling question" - a question which is so precisely targeted (like a smart bomb) that it delivers a huge amount of insight with great efficiency and dispatch. Information gathering is greatly expedited if telling questions are formed ahead of time. Rather than gathering everything we can find about crime in the cities we are comparing, we look for the FBI violent crime rate per 100,000. 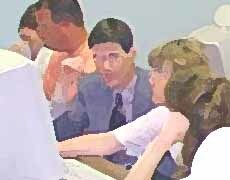 Teams make use of First Source - EBSCO (http://www.ebsco.com/Main.asp) - to start collecting pertinent information, carefully noting their findings (culled) in their word processing files under the appropriate questions. This is not surfing. It is carefully structured, thoughtful gathering. Time to stop and "take inventory." Which questions are well answered? Which ones require further investigation? Any new questions? Teams explore "free Internet" information resources listed on a Web page. The students enter the final phase of making sense from all the information gathered, starting to put their presentation and paper together. Students share their findings persuasively. This is an opportunity to put multimedia and presentation software such as HyperStudio or Powerpoint to work. Rather than building each lesson plan from scratch, the teachers are encouraged to save and then work from templates (on this page http://www.bham.wednet.edu/quest8.htm) which provide much of the structure, suggest activities and supply some of the directions. Teachers from other district could quite easily modify these same modules to match their own district by substituting a different district logo, for example. The HTML is already written and much of the work is already done. The job of the teacher is to supply the solid curriculum question and content. In the case of Bellingham in June, most of the units were built by teams of 2-6 teachers working a total of 24 hours each. While this is an enormous amount of effort, the finished product can support hundreds of teachers across a district, a state or an entire country. These were talented teachers, most of whom had already spent more than a year working with electronic information and the Net.While most were not skilled users of HTML code, there was always one person present to assist with the entry of text and instructions. One of the most time consuming aspects of this project was the "information harvesting" required to identify worthwhile "free Internet" resources. The team which created the volcano unit reported that it took them four hours to find two sound sites. The justification for this searching is, of course, the protection it provides for other teachers and their students who will be able to go right to the heart of the matter without wandering about. III. Why do Online Research Modules Work? As long as research modules are built upon essential questions, students are likely to find them highly engaging. Presented with authentic decisions, problems and choices from contemporary society or the past, students will usually approach the research task with energy and commitment. Authentic research involves students in issues from what is often called "the real world," a phrase which is almost surprising because we must add the word "real" to "world" or risk someone thinking we meant some "virtual world." All too often, unfortunately, school research has drawn its material from virtual worlds. Research modules communicate expectations and describe activities in clear, precise language which should eliminate confusion and minimize wasted time. These instructions (written by technologically confident teachers) are built into each day's activities so that students are likely to experience success even if they are visiting the computer lab or working in a classroom with a teacher who is uncertain or anxious about the use of technology. In some respects, these modules offer the same advantages as a guided tour. The research modules offer an antidote to the Web's lack of focus. While the distractions of a vast information landscape may make for great home entertainment and support valid "divergent exploration" for the skilled researcher, students probably need to learn how to work within such a landscape in a more focused manner to begin with or risk dozens of hours of inconsequential meandering. Those schools who set their students free to "surf the Web" without first equipping students with a toolkit of search skills and information literacy skills are taking a risky path. The educational landscape is littered with the wreckage of (well intended) progressive experiments in student research which foundered because students were set free to wander about with too little structure. The Open Classroom movement of the late 1960s is a case in point. There was a tendency to trust students' native abilities to find their way toward Truth and Insight without providing the scaffolding which would have helped them find their way and use their time productively. While some students managed to thrive in such unstructured environments, many students floundered and frittered. Eventually the parents demanded that we put walls back into open spaces and go "back to the basics." Today we see a return to the progressive agenda in the form of constructivist initiatives which hold more promise that the Open Classroom and Inquiry approaches of the 1960s because there is a growing respect for the structures which guide students through the research experience with some efficiency and productivity. While our ultimate goal may be to set students free to make their own way independently as lifelong learners who require no scaffolding, achievement of that goal probably requires a developmental process which begins with generous structuring and moves toward increasing levels of autonomy. Seen in this context, then, research modules are an introductory experience meant to provide students with success and a toolkit of research skills which will serve them well as they move toward independence. It may be worthwhile to explore the metaphor of a cathedral. If we forget the foundations and the flying buttresses, the stained glass windows and soaring spires will have no enduring value. Essential questions reside at the top of Bloom's Taxonomy (Bloom, 1954). They require students to EVALUATE (make a thoughtful choice between options, with the choice based upon clearly stated criteria), to SYNTHESIZE (invent a new or different version) or to ANALYZE (develop a thorough and complex understanding through skillful questioning). Essential questions spark our curiosity and sense of wonder. They derive from some deep wish to understand some thing which matters to us. Answers to essential questions cannot be found. They must be invented. It is something like cooking a great meal. The researcher goes out on a shopping expedition for the raw ingredients, but "the proof is in the pudding." Students must construct their own answers and make their own meaning from the information they have gathered. They create insight. Answering such questions may take a life time, and even then, the answers may only be tentative ones. This kind of research, like good writing, should proceed over the course of several weeks, with much of the information gathering taking place outside of formally scheduled class hours. Essential questions engage students in the kinds of real life applied problem-solving suggested by nearly every new curriculum report or outline curriculum standards such as the NCTM and the Science Standards. Essential questions usually lend themselves well to multidisciplinary investigations, requiring that students apply the skills and perspectives of math and language arts while wrestling with content from social studies or science. They invest personally in the quest for knowledge and understanding, in part because the questions or issues being investigated are drawn from their own curiosity about the world. Projects are pertinent and questions are essential. They feel excited, intrigued and motivated to solve the puzzles, make new answers and reach insight. Their work feels both important and worthwhile. They make thoughtful choices from a toolkit of strategies, considering carefully which approach, which source and which technique may work best to resolve a particular information challenge. They work with others in a coordinated, planful manner, splitting up the work according to a plan and sharing good ideas during the search for understanding. *These concepts are based upon the work of Barbara Means quoted in Plugging In.